If I ever had any doubt before, I now know the chickens are in charge. Up until tonight, they were just humoring me. 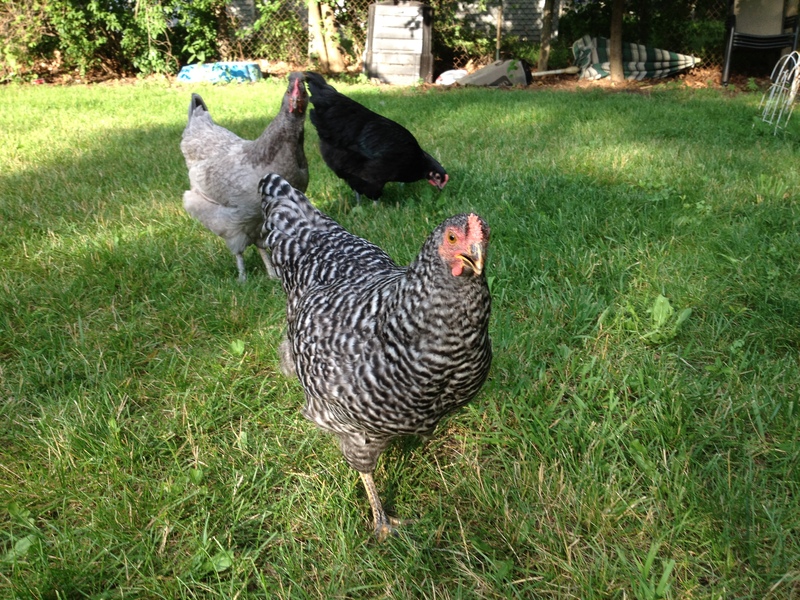 After dinner, I let the girls out for a quick evening stroll in the yard. They sauntered over to a cave-like bush near the house, and set up camp. Matt and I gardened, then I took a lengthy phone call with my brother. It had been about an hour, so I thought I’d put them back in the coop. I grabbed the Stand-n-Scoop poop-picker-upper, and walked toward the bush. Like a shepherd uses his walking stick, I use the Stand-n-Scoop to gently guide the chickens back to roost. I don’t touch the chickens, but use the black and pink stick to point them in the right direction. I quickly saw Loretta wasn’t having any of this. She squawked, and ran back into the bush. Loretta and Nellie quickly followed suit. This went on and on for about 15 minutes, until I gave up. We’re footloose and fancy free! I went into the house and grabbed a popsicle. “The birds put away?” Matt asked. I was hot and frustrated. I paused. I knew what he was asking. I left them out there vulnerable to predators, most specifically hawks. I didn’t know what else to do. I watched them from the kitchen window, and they all seemed fine. They threw themselves to the ground inside their cave clubhouse, taking luxurious dust baths. Surely a hawk couldn’t spot them in there, I tried to tell myself. I went out again and tried to round them up one more time. No luck. So I waited until dusk, which was 9:12 p.m. tonight. Before I got chickens I had heard that they naturally roost at sundown. And wouldn’t you know it, they lined up, just like clockwork. At first they huddled at the door of the coop, then Loretta went in first, followed by Nellie. Gigi was busy pecking at something, but quickly followed suit once she saw she was alone. A few weeks ago Matt jokingly suggested that we needed a butterfly net to catch the chickens. Now I’m thinking that’s not such a bad idea. I don’t know what could be cuter than that!! I used to round up our 6 chickens to put them into the coop – which was quite an ordeal catching them. One night we were at a game (they are in an enclosed coop/run) and came home to see that they had put themselves to bed. Now they are like a clock and march into the coop at about 9pm each night.